Alex Turner Lic Ac, MBAcC, MRSS(T) has been a complementary health practitioner since 1995 initially as a Tai Chi/Qigong instructor and has taught in London, Bristol and Devon. From 2001 he went on to become a shiatsu practitioner/teacher and later as an acupuncturist. He holds a Bachelor of Science degree in Acupuncture from the University of Kingston where he studied at the prestigious College of Integrated Chinese Medicine. His style of acupuncture integrates Traditional Chinese Medicine (TCM) and Five Element acupuncture. As well as using techniques such as moxibustion, cupping and guasha, he also brings his bodywork experience to the treatment, which may include techniques such as acupressure, Channel palpation and gentle stretching. Alex is a registered shiatsu teacher with the Shiatsu Society UK. He was Course Director and tutor at The Devon School of Shiatsu where he also taught for many years before moving to Bristol. 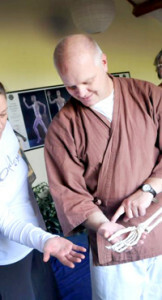 As well has having a busy private practice he also teaches at The Bristol School of Shiatsu. He is part of The Core Therapy Team at the Penny Brohn Cancer Care Center where he is an acupuncturist on The Treatment Support Clinic. He also practices shiatsu there and teaches Qi Gong, relaxation techniques and facilitates residential courses on the ‘Whole Person Approach’ to health and well being. Alex is a registered and fully licensed member of the British Acupuncture Council and the Shiatsu Society and adheres to their codes and ethics of professionalism. With nearly 25 years of experience practicing T’ai Chi, Qigong, Aikido and Meditation, Alex can also advise on energy building and strengthening exercises, postural alignment, relaxation techniques and meditation that are based on these disciplines. Alex offers tutorials and workshops for current students and postgraduates of shiatsu to deepen and further develop their practice.